We've caught site of the HTC Explorer (formally the Pico) a couple of times previously, with both blurry cam and press shots in tow. Now however, it's time for the Explorer to strut its stuff officially. Today HTC announced the HTC Explorer as their latest Android device. It finds itself as the most compact of its brothers measuring just 102.8mm x 57.2mm x 12.9mm and sporting a 3.2" HVGA display. The Explorer comes into HTC's product range underneath the Wildfire/Wildfire S and puts the Brew-based HTC Smart out to pasture whilst it's at it. Being the scrawny new handset in the smartphone world can be daunting, but the Explorer has got a decent amount of hardware to keep it afloat. It essentially runs the Wildfire S hardware rebodied, but with HTC's intentions to make this their most affordable smartphone yet, aspects like the camera resolution have been turned down to 3.15MP (from the Wildfire S' 5MP unit) for example. Beyond this however, the Explorer promises a full Android smartphone experience, complete with the latest Sense 3.5 UI. There's full web browsing with Flash support, social network integration and many other popular features that HTC consistently improve on. A couple of extra features, unique to the Explorer that HTC are pleased to point out are the inbuilt data monitor, which based on the users they expect to go for this device, allows you to track and manage your data allowance and usage on your package, without looking for a 3rd party management system. One other key ability that the Explorer possess is an exchangeable back cover system. 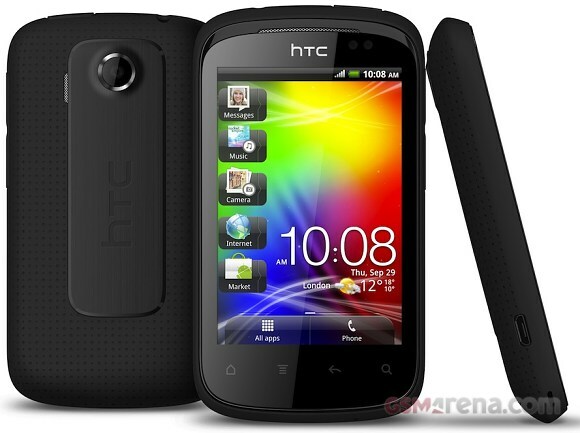 Nothing new on its own, but the first in the current line of HTC droids, presumably just to mix things up. Colors include; Active Black, Active Navy, Metallic Black and Metallic Navy when purchased, with India-based customers having the additional options of Active Royal and Metallic Royal. Extra covers can be purchased separately in a further 4 colors at least; Active Blue, Active Orange, Active White and Active Purple. The HTC Explorer should become available in Q4 this year with planned launches in key markets in Europe, Middle East, Africa and Asia. For now that's all we can tell you about the new HTC Explorer, but we have a sneaking suspicion it might pop up at a certain upcoming London event. If so we'll do the decent thing and grab both stills and a hands-on, naturally, but until then, we'll have to just keep staring at the pictures.